RTMaps from Intempora is a component-based software development and execution environment which enables users to time-stamp, record, synchronize and play back data from various sensors and vehicle buses. To make the vision of autonomous driving a reality, it is important to always know the vehicle position within its environment at any given time. This is also required if no detailed map or satellite navigation is available. In these cases, SLAM algorithms offer a smart solution. The multisensor development environment RTMaps provides a range of algorithms for developing functions for autonomous driving. Intempora has released RTMaps 4.5, which allows for a faster development of functions for automated driving on embedded platforms. 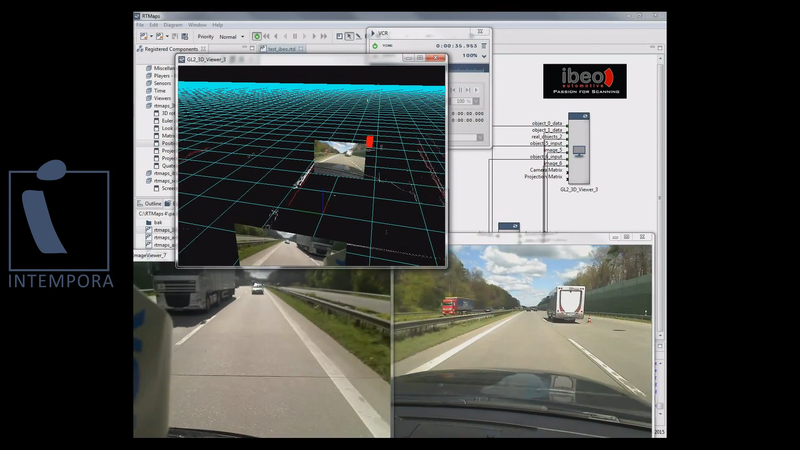 The new version of RTMaps supports the most recent embedded platforms for highly automated driving and provides the unique Remote Studio1), which makes it possible to use a PC with a remote connection to develop perception and fusion algorithms directly on target platforms. RTMaps Remote Studio1) for the easy development of applications on embedded platforms by using a PC without a mouse, keyboard, or monitor. NAVYA relies on the multisensor development environment RTMaps from Intempora to develop complex functions for autonomous driving for the NAVYA ARMA, which is considered to be the first driverless production vehicle for regular traffic. dSPACE and Intempora have built a cooperation that aims at providing a superior tool chain for developing advanced driver assistance systems and functions for highly automated driving. dSPACE will globally and exclusively distribute RTMaps by Intempora, an unparalleled software environment for multisensor applications. This article gives you a brief overview of RTMaps and how it is seamlessly integrated into the dSPACE tool chain. The training courses are dedicated to engineers involved in prototyping multisensor applications. You will learn how to acquire, process, synchronously record and play back sensor data in RTMaps. In the advanced course, you will gain hands-on experience in integrating algorithms using Python, C++, or Simulink® and learn how to use RTMaps in combination with dSPACE tool chain. You will also learn to develop and run applications on embedded platforms. RTMaps – a modular, multithread frame-work for real-time, multisensor applications. 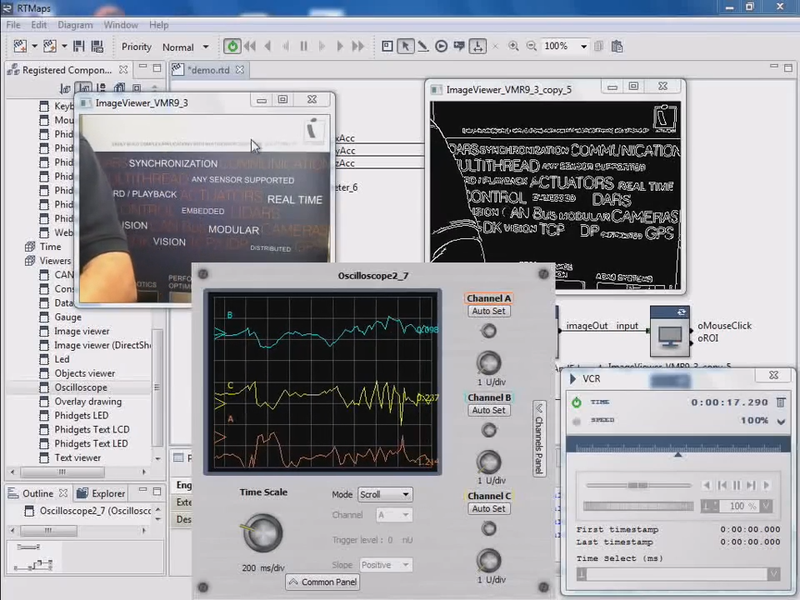 RTMaps Remote Studio – Develop algorithms directly on an embedded platform without having to connect a mouse, keyboard and monitor. Demo video of RTMaps with two simple sensors (a webcam and a 3-axis accelerometer). A one-minute demo video of RTMaps. Multisensor applications play an essential role in many areas such as advanced driver assistance systems, autonomous driving, multimodal human-machine interfaces, robotics and aerospace. Developing these kinds of applications in the lab or in the vehicle typically requires capturing, synchronizing and processing data in real time from various sensors such as cameras, laser scanners, radars or GNSS receivers and interfacing with communication networks, such as CAN/CAN FD, LIN or Ethernet. During the test and development phase, it is also essential to be able to record, visualize and play back time-correlated data. RTMaps (Real-Time Multisensor applications) from Intempora (www.intempora.com) is designed specifically for these use cases. It provides a modular development and run-time environment for x86- and ARM-based platforms supporting operating systems such as Microsoft Windows® and Linux. With RTMaps, data is acquired asynchronously and each data sample is captured along with its time stamp at its own genuine pace. This ensures that all data is time-correlated. RTMaps’ unparalleled performance on multicore CPUs enables users to get the most out of their computing architectures and easily set up applications that handle multiple, high-bandwidth data streams, including real-time processing and data fusion. Sensor data can be recorded and played back synchronously for offline development and testing under reproducible conditions. RTMaps provides comprehensive component libraries for automotive sensors, buses and perception algorithms and it supports any type and quantity of sensors and actuators. Algorithms can be developed easily by means of block diagrams or by integrating own code using dedicated software development kits for C++ and Python. It is even possible to process data on multiple distributed platforms while preserving time coherency and synchronization of heterogeneous data streams. RTMaps is tightly integrated in the dSPACE tool chain. For this, dSPACE provides an interface blockset designed specifically for dSPACE’s PC-based simulation platform VEOS and dSPACE real-time systems to exchange data with low latencies and synchronize clocks with RTMaps. In addition, dSPACE ControlDesk® can be connected to RTMaps via the ASAM XIL API, which lets users monitor and parameterize components that are implemented and processed in RTMaps. Support for additional components on request. dSPACE cooperates with Intempora dSPACE and Intempora have announced an exclusive cooperation that aims at providing a superior tool chain for developing advanced driver assistance systems (ADAS) and highly automated driving functions.